finding the right GTD tools and using them consistently. I am certainly no exception to these two points. In only a couple of months since I started Getting Things Done, I think I must have tried close to 10 digital and/or analog GTD tools. The digital GTD tools I have used will be featured in another blog entry, along with the (dis)advantages of using them. 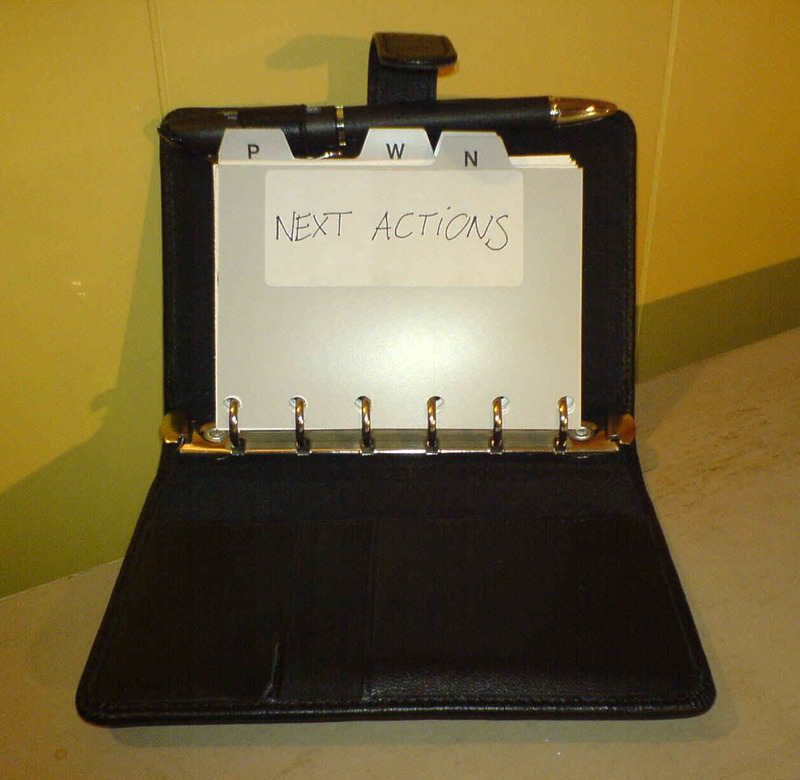 One of the analog GTD systems I settled on fairly quickly after starting my GTD adventure is described in the rest of this blog entry, also stating the reasons why I am not using it anymore. I have a long history of using digital equipment for organizing my appointments, tasks, notes, et cetera. Somewhere in my room you may still find my trusty PDA, a Casio E-200. More than 1 year ago I ditched the PDA and started using pen and paper once again, for making notes, scheduling appointments, keeping track of to-do lists and so on. For the year of 2006 I bought a large paper diary with one day per page; the feeling of freedom and creativity while writing, sketching or planning in my paper diary was awesome! After using several digital GTD tools on my laptop -some of them horrible, others quite usable- I decided that a completely analog (paper-based) approach to GTD would probably give me the same feeling of freedom and creativity that I got from using a paper diary again. I have to say that reading (blogs), watching (flickr) and discussing (groups) other people’s ideas and GTD systems is a great way to create your very own. I have to admit one thing: looking for and playing around with different GTD tools/systems is something I really like to do, so much so that it sometimes distracts me from actually Getting Things Done! Therefore, one word of warning from my own experience, get things done first, finetune your tools after! In other words, make sure the GTD methodology is top priority and the GTD tools you use come second. Having said that, I do think that having and using excellent, finetuned GTD tools -which simply must be fun and easy to use- will make it easier to implement GTD and more importantly, to keep GTD up and running smoothly. Actually, this GTD system is completely analog (you only need a pen and index cards), is compact and easily extendible. So why don’t I use it anymore?? I told you I was writing several items (up to 20) on 1 index card and that I tend to have a lot of projects and next actions (which is why I started to write more than 1 item on each index card in the first place!). I was slowly but surely feeling the need to sort, filter and group my projects (and more importantly my next actions) dynamically. And guess what? That is not something easily done with this analog GTD system! VoilÃ , the most important reason for me to abandon this GTD system after a while. The second, less important reason for abandoning this GTD system, is that it is not very portable in all circumstances. As long as I carry it around in my bag it is perfectly fine. If I need to stuff it into my pants or shirt pocket it is simply too big and heavy. Exit leather binder with index cards! At the moment I am successfully using a hybrid system, that is, taking the best of both worlds: sorting, filtering and grouping can be easily done in my custom built Excel GTD system; writing, sketching, planning and scheduling are done on paper, namely 2 PocketMods and a Moleskine pocket diary 2007 (day per page). The digital and analog parts of the hybrid system can work completely autonomously if need be, but in practice they work together and complement each other perfectly. Information from my Excel-based GTD system is “synchronized” daily to my PocketMods and vice versa. The 100% analog GTD system described above just didn’t cut it for me, since I feel the need to sort, filter and group my next actions (and projects) dynamically. On top of that, even though the leather binder is quite small, it is still too big and cumbersome for some situations. I need to be able to carry my mobile GTD system with me all the time! 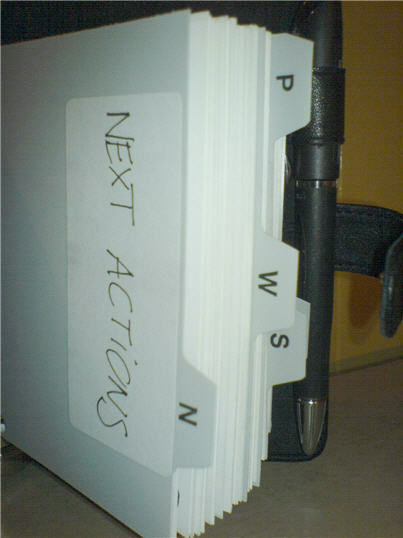 A final thought: don’t be surprised to find that I have swapped or altered GTD systems again in a few weeks or months. In fact, my Moleskine Info Book with GTD hack is screaming to be used! You can fight it, but I have chosen to accept it: it’s all part of the process of finding the perfect tools for Getting Things Done! I had the same issue, I just found that the index cards weren’t sustainable.